These 50 lb brine blocks are formed from high purity food-grade salt and are intended for convenient, dust-free insertion to brine tanks. 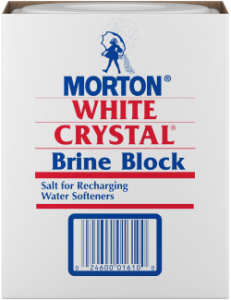 White Crystal® Brine Blocks can be used in water softeners with grid or platform tanks that accommodate blocks. Shipped in a protective cardboard sleeve and available in 50 lb blocks (48 per pallet).